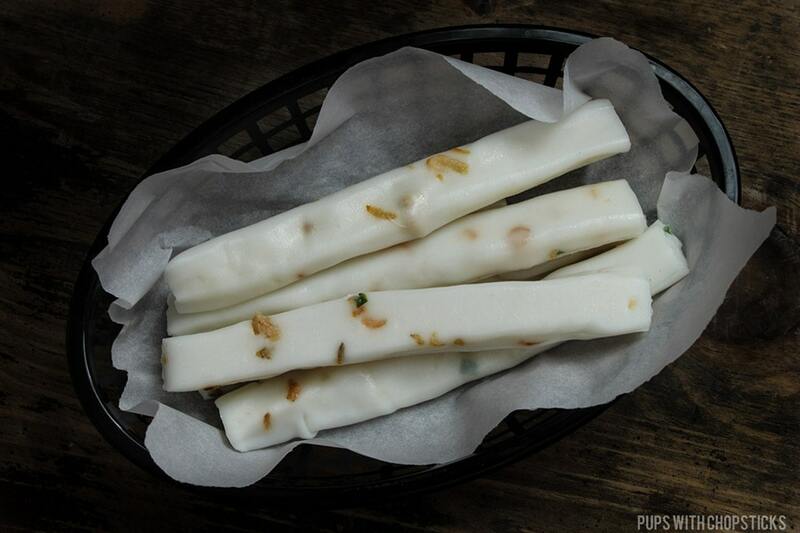 Chinese Rice Noodle rolls (Cheung Fun) are made from thin sheets of rice noodles that have been steamed and then rolled into long tubular rice rolls. Great as quick snacks either steamed or pan fried to crispiness. Chinese rice noodle rolls (cheung fun) are most commonly eaten for breakfast or as a snack. When it is steamed, it is a light springy noodle roll that is usually dipped in a light soy sauce or slathered in a sweet hoisin or sesame paste. They can also be pan fried to make them crispy and springy, but again is eaten the same way with a bit of soy sauce, sweet hoisin or sesame paste. Since these rice noodle rolls are fresh, you cannot (and should not) buy them online. You can find these noodles in Asian grocery stores, usually in the refrigerated section with the fresh noodles. They usually come in two varieties : plain or with dried shrimp with green onions. Unlike it’s cousin the Korean rice rolls, these are not super chewy. When they are steamed they are soft and slightly springy and when they are pan fried they are crispy and slightly springy. These should be stored in the fridge. The packages almost always will have expiry dates on them, try not to keep them for longer than the expiry dates. Before you use them examine them to make sure you don’t see any funky pink or black mold on it.